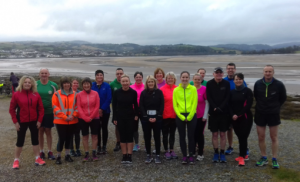 A busy weekend for racing started early on Saturday morning with many Run Leaders and Harriers supporting our latest Run for Fun graduates around the Conwy Parkrun course for their first 5k. A clear morning at Conwy saw 8 graduates complete the course with all thrilled by their achievements afterwards and quite rightly so. Harrier Sarah Bayliss also ran a PB performance of 26:26 as she continues to return strongly from injury. So next to Llantysilio, Four hardy Harriers turned out for the hilly Llantysilio Fell Race. A 6.2 mile race with an eye-watering 2300 foot of ascent, climbing up Moel Morfudd and Moel y Gamelin. Conditions were good – dry, no wind, 4C – and the views of the Dee Valley were splendid. Tony Wood was first Harrier home in 17th position in a time of 1hr 5 mins, Ceri Belshaw was 37th in 1hr 16 and 4 th Lady, just missing out on a podium position at her first race of the weekend. Sioned Lloyd Griffiths was 65th in a time of 1.29, followed by Menai Baugh finishing in 66th position in 1hr 32 and winning the F60 prize. 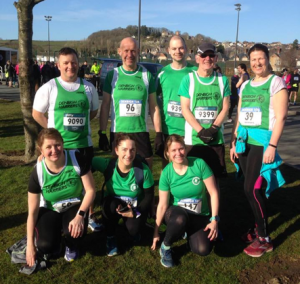 Sunday started sunny with no wind after a hard frost overnight and the conditions boding well for fast times at the Denbighshire 5k & 10k races. But make no mistake these are hilly tough road races. The 10K must be one of the hardest races in the calendar, and the 5K goes spectacularly off-road in the final mile. In her second race of the weekend in the 10k Ceri Belshaw not only made the podium – she took it – as first lady home in 47:12 showing her speed and skill both on and off road. In the men’s race, new member Huw Williams the first male Harrier home in 18th and 43:14 with all Harriers, many of them new runners, posting very good times in this tough race. Over the 5k race, Martin Cortvriend finished 3rd in an astonishing 21:57 as 1st M60, just 30 seconds and 40 years behind the overall winner. 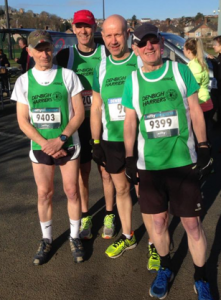 Ron Birch took 1st M70 in 39:26 with Chris Baldwin 2nd M60 in 26:08 with Clwyd & Catherine Owen showing continued improvement having recently graduated from our Run for Fun programme. This entry was posted in 10k, 5K, Fell running, Parkrun, Run for Fun, Weekly report. Bookmark the permalink.